I was planning to write this post on teaching texts written in languages other than English, and while I still want to write that post soon, another idea has been in the back of my head for the past couple of weeks. Every semester has its ups and downs in terms of how individual class periods go and how much it feels as if you and your students are on the same page. Maybe your students did not read or the lesson plan didn’t go exactly right. Sometimes we hit these little bumps and then they slide right past us—the class moves on and everything is back to normal. Other times, it can feel like your class never quite recovers the momentum once it is lost. The idea of how to move beyond the bad days and the little teaching slumps that are inevitable is something that I have been considering recently. There are lots of ways to do this, of course. You can address it head on and discuss with your students if they have or have not been reading or if they aren’t engaged in the material for a particular reason. You can give them a well-timed break or period off. Maybe, if they are worried about their papers or other assignments, classroom time can be used to discuss their plans or work on their papers. And, candy, there is always candy. But what if you don’t want to interrupt the flow of the semester. How can you move the content forward and still energize your classroom? What are classroom activities that are particularly engaging and particularly pedagogical? I am going to outline two activities I have used as lesson plans that brought some excitement to the classroom. I’m not suggesting that these activities are necessarily revolutionary in terms of being outside the norm of what we do in our classroom on a regular basis, but placing them strategically in the semester and dedicating a larger portion of the class period to them can be a needed change of pace. Compare/Contrast Different Versions of Texts: Showing students different versions of texts—whether various drafts of an author’s poem or a serialized newspaper printing of a novel verses a bound copy—often generates creative class discussion because students are asked to not deal with an isolated work but draw connections between diverse pieces. I especially enjoy doing this activity with stories that have become part of the culture of American society. For example, it is always fun to hear students’ versions of Rip Van Winkle. I also like to do a comparative lesson plan with “The Legend of Sleepy Hollow.” Students will be familiar with the story; some of them will have been watching the Fox television show. The text of Washington Irving’s story is not always what they expect, however. With its long descriptions of food and and its gangly protagonist, students might have trouble reconciling the version of Sleepy Hollow they have in their head and the one that is on the page. It is useful to interrogate these differences in order to think about how stories get changed and revised over time. One place to put particular emphasis in the comparison is on Ichabod Crane himself. The descriptions of him in the text are not flattering. For example, this is a descriptive sentence about Crane when he is first introduced, “To see him striding along the profile of a hill on a windy day, with his clothes bagging and fluttering about him, one might have mistaken him for the genius of famine descending upon the earth, or some scarecrow eloped from a cornfield.” Irving is adamant that Crane has very specific physical features and many modern versions (except the cartoon) erase this image of Ichabod. Instead Crane has piercing blue eyes in the television show and is very Johnny Depp looking, when played by Johnny Depp in the 1999 movie. Hollywood has a habit of casting pretty people in all roles, so in many ways this is not unusual; however, it is worth a discussion because it helps students think about what Irving is trying to achieve with Crane. Is Crane the protagonist of the story? How do we as readers understand him? How do our sympathies change or adjust as the story proceeds? Ichabod Crane or Ichabod Crane? You can put emphasis on different similarities/contrasts in the clips as you watch each of them. It is interesting, for instance, to think about the level of the introduction of supernatural and paranormal elements in each of the versions. Sleepy Hollow works well for this exercise because there are so many different versions of it, but anything with more than one option can be molded into this kind of lesson. Plot Our Own Piece of Fiction: Often I will have students write their own poems and act out scenes from plays, but one of my favorite versions of such an idea is to have us work as a class plotting an outline for a short story. 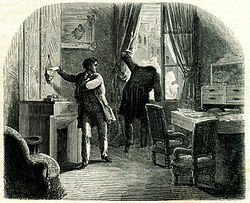 This has worked particularly well in the past as an exercise with Edgar Allan Poe’s “The Purloined Letter.” When I have done this, I have my students read Poe’s “The Purloined Letter” for that class period, and we used the literary term, convention, to structure the lesson. One student was in charge of defining the word for the class. After the word was defined, I asked all of the students to contribute to a list of conventions in detective fiction. The list included character descriptions, such as intellectual detective with loyal sidekick and bumbling police officer, and plot points, like red herring and dramatic climax. They pulled from Poe’s work but also recognized the device in material from Law and Order to Scooby-Doo. After compiling our list, we used the conventions to create the plot of a piece of detective fiction. I listed all of the conventions on the board (or on my laptop) and had students add detail to the different plot elements as we go. In one class, my students really took to this and were very creative in their plotting. They named their villain, Thaddeus von Tressell, and set up an elaborate plot with descriptions of the other characters, the crime, and the means of resolution. By the end of class, we had an entire outline for a potential detective story. This exercise has been genuinely fun for students, but it also asks them to see connections across time in one genre. Making a connection between Scooby-Doo and a Poe story might seem silly, but it makes them think in a broader way about American literary history. Connection is a word I return to over and over again as I think about pedagogy. I don’t want my students to think of our class or our texts as isolated. In order to ask them to think in this way, I need to help them draw specific connections between different ideas and texts. This exercise is one way to get all of our brains thinking in this manner. What do you do to generate energy in the classroom? How do you get you and your students over classroom hurdles? Feel free to comment or tweet us (@PedagogyAmLitSt) some of your best classroom activities. ← Trans-Atlantic? Transatlantic? trans-atlantic? transatlantic?